You will feel right at home when you walk into this modern mountain 3 Bedroom, 2 Bathroom Tahoe escape in a central Truckee location with a sophisticated use of space. This newer family community contains private views from your balcony and a recreation center available to you within walking distance which includes a full-size pool, hot tub, gym, bocce court, volleyball court, and horseshoe pits. The master is equipped with a King size bed and a private full bathroom including double vanity sinks. The room just past the kitchen has a King bed, while the room at the end of the hall past the full bathroom has two twin beds and television making this quaint home sleep up to six! As you enter from the front door you will feel the fresh tone of newer carpets, furnishings, and fixtures. The open floor plan announces a rustic stone tile kitchen floor, granite countertops with bar stools and newer appliances. The living room seen perfectly from the kitchen includes a cherry dining table, beige couch, and a gas fireplace to maintain the mood. Having a corner unit not only means extra privacy but also larger views. There are heat controls in each room which keeps everyone comfortable. 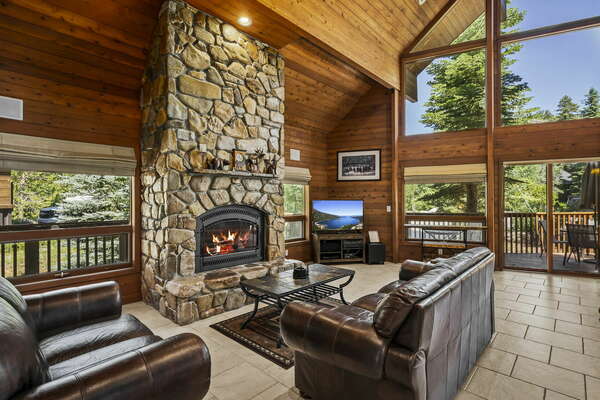 Catch a breath of fresh air and smell of Tahoe as you relax on the deck off the living room or while you barbecue at home with friends or family. Truckee Boulders Vacation Getaway is centrally located in Truckee, offering easy access to Hwy 80 and 89 and just a short drive to Donner Lake, Lake Tahoe, Squaw Valley, and Downtown Truckee. Feel free to walk to the grocery store just around the corner and also to several restaurants, as well as a coffee shop. This newer family community contains private views from your balcony and a recreation center available to you within walking distance which includes a full-size pool, hot tub, gym, bocce court, volleyball court, and horseshoe pits.